iPod Touch 4 has a ton of features carried over from iPhone 4. The processor is the same A4 chip as the iPhone. There's an integrated gyroscope now for more fine-grain gaming control. The Wi-Fi antenna now supports 802.11n at 2.4GHz. And last, but not least, the LCD is the same 3.5-inch "retina" display used on the iPhone 4, sporting a 960x640 resolution. All the iPod Touch 4g support MP4, MOV or M4V in a better way. And Tivo shows are absolutely not compatible with iPod Touch 4g. If you want to put and play TiVo videos from TiVo to iPod Touch 4, please follow this guide to complete it. How to convert and play TiVo shows to iPod Touch 4g? Parts 2: Convert TiVo to iPod Touch 4g. Parts 3: Transfer converted TiVo shows to iPod Touch 4g. To transfer TiVo shows to PC, you need to download TiVo Desktop Software. When your TiVo is connected to your home network, TiVo Desktop provides you with a list of available shows for transferring to your PC. Parts 2: Convert TiVo to iPod Touch 4g MP4. Enter Media Access Key for your TiVo files from “Option” button and then load TiVo files to the TiVo to iPod Touch 4Converter. Step 3: Choose MP4, MOV or M4V as output format for iPod Touch 4g. Click the "Format" option and navigate the mouse cursor to iPod > iPod Touch 2 H.264 640x480 (*.mp4) or iPod Touch 2 (*.mov, *.m4v) as output profile. We are choosing this format, as we can convert TiVo shows to iPod Touch 4G movies. Click the "Settings" button, and enter 960*640 as the output video size in pixels. Click “Convert” button to start converting TiVo to MP4 for iPod Touch 4. Check “Merge into one file” to join all TiVo files to one output iPod Touch 4g MP4 file before start conversion. 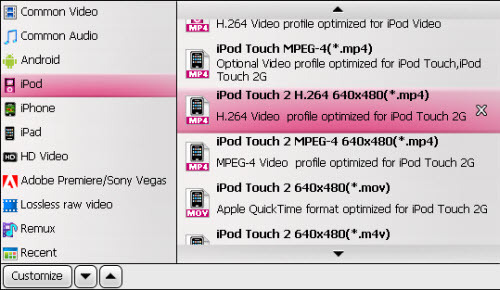 After converting your TiVo shows to iPod Touch 4g, you will get MP4, MOV or M4V in destination folder. Then you can transfer your videos to iPod Touch 4g for playing. Now you are free to enjoy your TiVo recordings on iPod Touch 4g whenever you like.